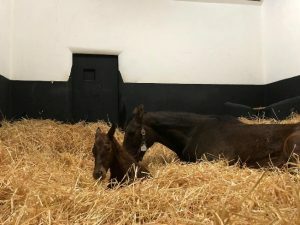 Larry Byrne (IRE) and Lucie Dieuaide (FR) give you an insight into their third week here on the Irish National Stud Thoroughbred Breeding course. All of the students are now familiar with their training tasks in the different yards and are enjoying their training schedules. 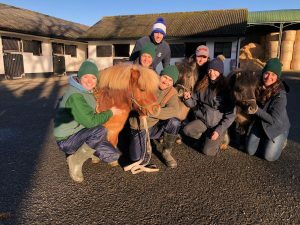 Three more foals were born during the week with assistance from foaling attendants Lauren and Nicola and helped by students Rebecca, Fabian, Vicky and Poppy. In Maddenstown yard all of the Falabella ponies are being pampered and groomed for the reopening of the stud. Homer, Marge and Bart are now looking their best for welcoming visitors on the 11th February. On Saturday, a handful of students went to the races at Leopardstown as part of the Dublin Racing Festival. With four Group one races during the day, the students were able to see the amazing victory of champion mare Apple’s Jade, as well as that of Le Richebourg and Min. It is anticipated that these horses will race in Cheltenham next March. 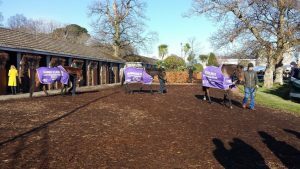 The Irish National Stud Living Legends, Hurricane Fly and Hardy Eustace, were also present for a parade as former winners of the Irish Champion Hurdle.